You are looking at glycoprotein receptor sites on the surface of a red blood cell in the image in our banner at the top of this page. This glycan layer is the operating system (OS) for cellular communication. Sugars give LIFE to the cell. Like thick fuzz on a peach, healthy cells are coated with these Smart Sugars. Unhealthy cells have less dense glycans or, as on cancer cells, these polysacchrides are missing altogether, leaving the cancer cells bald, toxic, and infectious. Medical scientists agree that the Gold Standard for future medical diagnostics, especially for cancer, will be to analyze the quantity and quality of these glycoproteins in the human body. The future of medicine and healthcare is Glycoscience. Scientists agree that the explosive technological advances in Glycoscience will transform medicine and healthcare. While at it, Glycoscience has the potential to dramatically reduce healthcare costs. Click Here to Learn More about the exciting new world of Glycoscience! 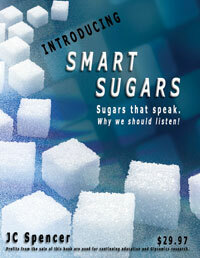 We want to give you a new little science book FREE entitled: Introducing Smart Sugars. The subtitle is: Sugars that speak. Why we should listen! This science book will be available on Amazon and other national outlets for $29.97 but we want you to your own personal download copy right now without cost by subscribing to our Glycoscience News Updates on the right. We are preparing a series of books and educational material that will be made available online and in full color perfect bound editions. You have our permission to forward this to your friends so they can have the free book also. Thanks for helping educate others in Glycoscience. the Book at No Cost Today! Your NEWS source on the latest in glycomics, the science that will forever change the way we live. © Copyright permission granted to The Endowment for Medical Research, Inc. And may not be reproduced in any form.